Atlanta, GA, December 6, 2018: Asmi Kumar of Northwestern Middle School, Milton Georgia took home the second-place mathematics award at the Broadcom MASTERS competition receiving $2,500 and an iPad. Her team also won the best team award, each winning an iPod. Kumar’s project, ‘Developing a Device to Predict Autistic Meltdowns Using Arduino and MS Azure’, is meant to track and analyze unpredictable effects of autism. “As effects of autism such as seizures and meltdowns are highly unpredictable, it is of importance to design a way to predict, track, and analyze these outbursts,” says Kumar. Inspired to work on the idea when she saw difficulties experienced by her friend’s sister who is autistic, Kumar, 14, built and programmed a wearable device that tracks users’ heart rates. As someone wears it on their wrist, the device sends data to a web-based and mobile program. The program calculates the beats per minute. It also calculates additional statistics dealing with the intervals and peaks as the heartbeat rate changes. The program then compares those data to the “normal” heart rate range for each individual user. The data collected is delivered via Bluetooth to a mobile application on an external device. Using specialized analysis processes, the data is studied for anomalies, possible indicators for meltdowns. If a meltdown is suspected, the mobile application connected to the device sends out a warning notification. Testing with peers, publicly available data and simulated data showed that the device could accurately detect and predict abnormal heartbeat rates. “For the future, I wish to add more detectors for oncoming meltdowns, such as adding sensors for galvanic skin response, sweat levels, body temperature, anxiety levels, etc. to increase amount of data recorded, and accuracy of my device,” says Kumar. “I hope to attend the Canada/USA Mathcamp which is an intensive five-week summer program for students who are mathematically-inclined/talented,” says Kumar about spending her winnings. Kumar was a national MATHCOUNTS finalist this past May. 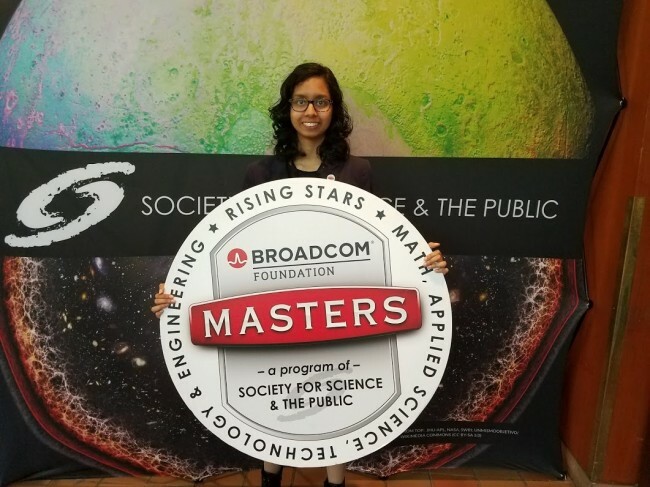 Broadcom MASTERS, a program founded and produced by the Society for Science & the Public, encourages middle school students to translate their interests into a passion for STEM. Students who rank in the top 10% of their local science fair qualify to enter the competition. More than 2,500 students entered this year’s competition. The top 30 finalists traveled to Washington,DC where they competed in a four-day STEM competition. National finalists met and interacted with Ivanka Trump. Kumar has been recognized by the Senator David Perdue’s office in Washington DC for her work. It’s beautiful to see desi kids’ achievements in our community newspaper! Thank you Jyothsna for the wonderful write-up!